Congratulations to our Term Four Award Winners! 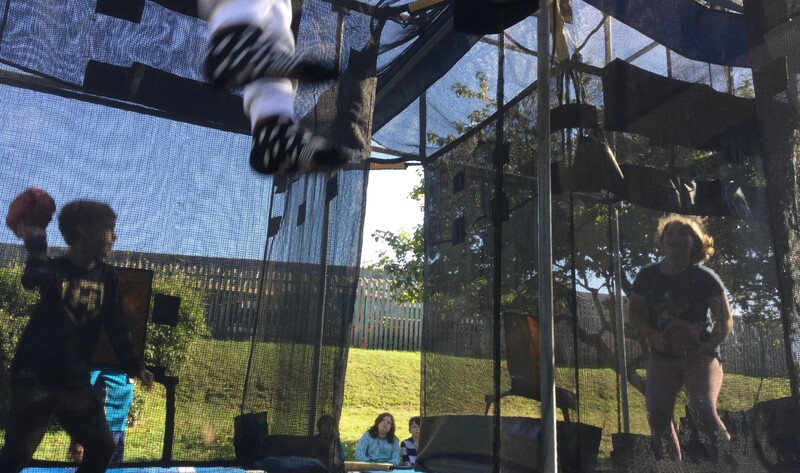 Everybody in The Eyrie has continued to impress but these were the lucky children to be specially rewarded for their Curiosity, Responsibility, Enterprise, Determination and Friendship. 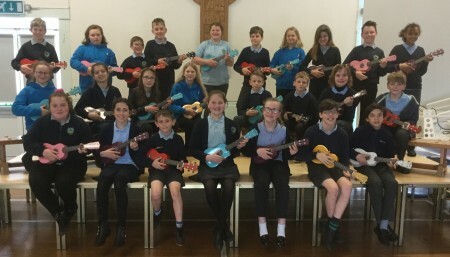 The Year Six Ukelele Band headlined the recent Awards Assembly in front of a packed school hall. We played our own family-friendly version of the Jessie J hit from 2011 called Price Tag. Our thanks to Mrs Munro for coming up with this idea. It sounded really good. Over many years, other giraffes were born with longer necks. These giraffes survived better than the giraffes with the shorter necks and eventually all of the giraffes had long necks. Our challenge was to paint our giraffes using only natural ingredients. 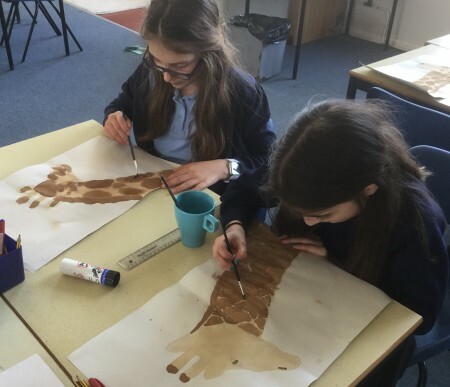 The light brown stain colour was made using tea and the darker brown stain using coffee. It’s the tannins in these plants that give them their brown colour. We then used lemon juice as a natural bleach to create lighter central sections within the brown patches. 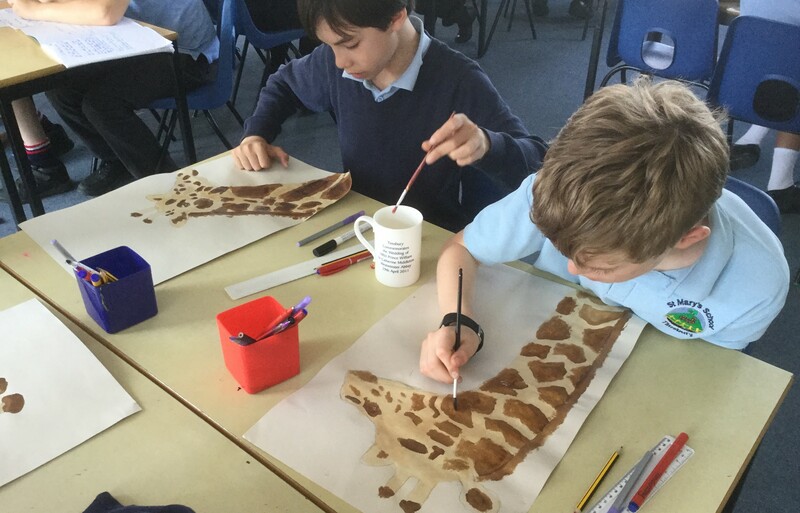 For our final Science Meets Art challenge we had to create a picture of a giraffe. We chose giraffes because we have been learning about why giraffes have long necks. Long ago, giraffes didn’t have long necks. They wanted to eat the higher leaves but had to compete with elephants and antelopes for the lower leaves. One day, a giraffe was born with a slightly longer neck. She could reach the food and the juicy leaves. When she had young, some of them also had longer necks and they too were better at reaching for food. Obviously, the performers would not be in view on the Britain’s Got Talent stage, so this is what David Walliams would see. The objects in front of the projector block the light creating shadows. Each group had to think about how to make the shadows the right size. This was the Science involved. The closer the object is to the light source, the larger the shadow because it blocks more of the light. Do you remember the act called Attraction who won Britain’s Got Talent in 2013? They were a Hungarian shadow theatre group. We watched videos of their performances to inspire our second Science Meets Art challenge. We had to work in groups to find ways in which we could create our own shadow theatre image. In this photo, you can see how the picture of a giant megalodon attacking a small sailing boat was created. We planned our pictures before we began the melting process so we knew what we were aiming to produce. There were some very clever ideas. 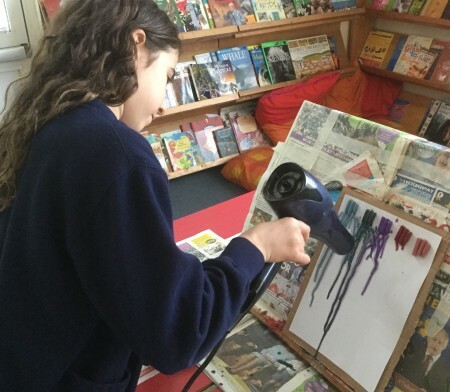 Many children used the drips of wax to look like rain and added cut out silhouettes of people holding umbrellas. Others used the drips to look like crazy hairstyles or the branches of a tree. You can see these on the Y6 corridor display if you get the chance. In the photo, you can see a phoenix rising from the flames. This year’s Science Event was called Science Meets Art. Each class worked on projects which created artwork through carrying out scientific processes. In our first challenge, we had to make pictures formed by melting wax crayons. We glued the crayons onto our canvas and then used a hair dryer to melt them, aiming to move the drips in the direction we wanted them to go. Did you know that wax crayons melt at around 38 degrees Celsius? Our Sponsored Circuits sessions were good fun but it’s fair to say we had aching arms and legs afterwards! We had to do squats, dips, star jumps, sit ups and press ups. It certainly tested our fitness levels but we all did brilliantly and helped to raise a lot of money. Thank you to everybody who supported the Eagles. The Life Education Van arrived and we went aboard to learn about drugs and to discuss peer pressure. We talked about different legal and illegal drugs and also were guided through some scenarios where a friend might get you to try to do something you didn’t want to do and how we could deal with these difficult situations successfully. 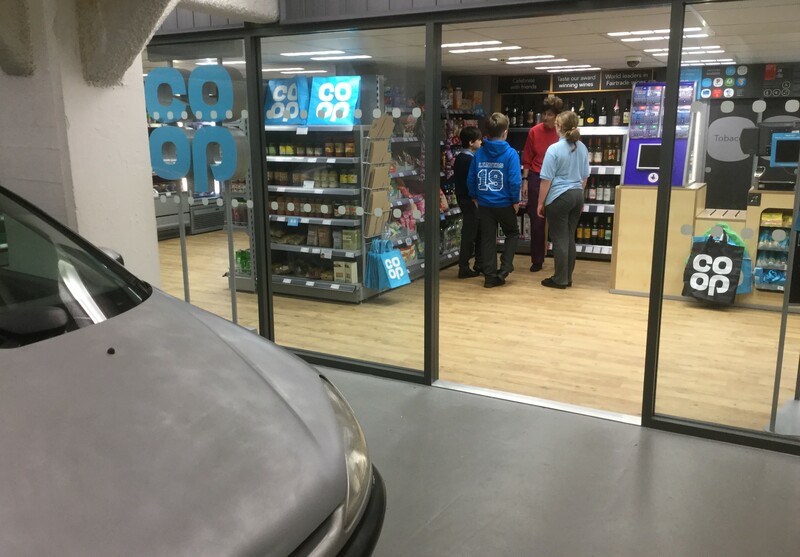 In this session, we were looking at a range of different types of drinks. 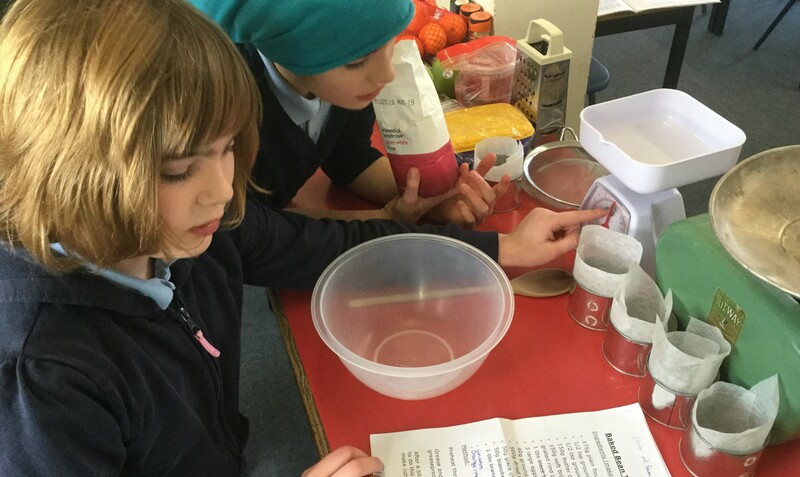 We read the ingredients to find out how much sugar had been added to each of them. 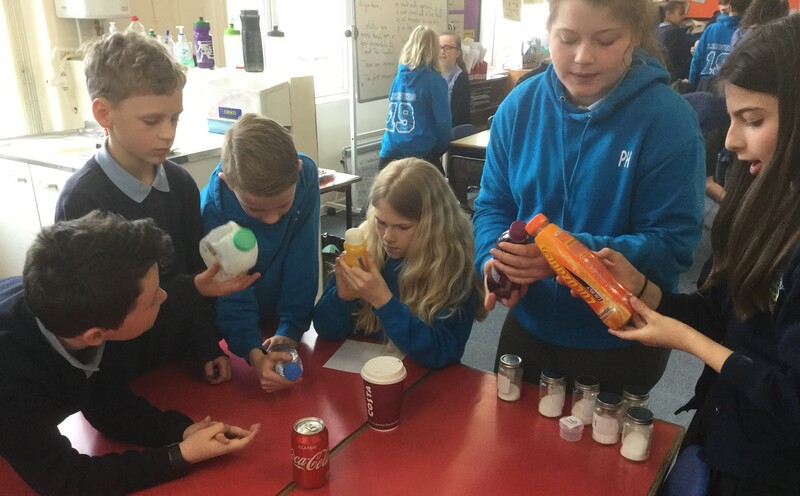 We were very surprised when we discovered how high the amount of sugar was that is contained within drinks such as Coca-Cola and Ribena. 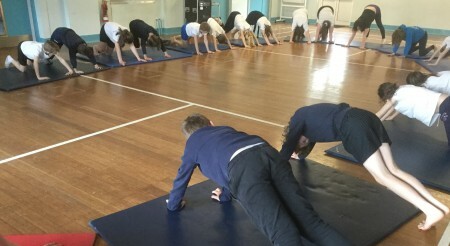 This is us enjoying a yoga class as part of Healthy Choices Week. A visiting teacher taught us several different yoga positions. Yoga is an ancient form of exercise that focuses on strength, flexibility and breathing to boost physical and mental wellbeing. The main components of yoga are postures (a series of movements designed to increase strength and flexibility) and breathing. The practice originated in India about 5,000 years ago. 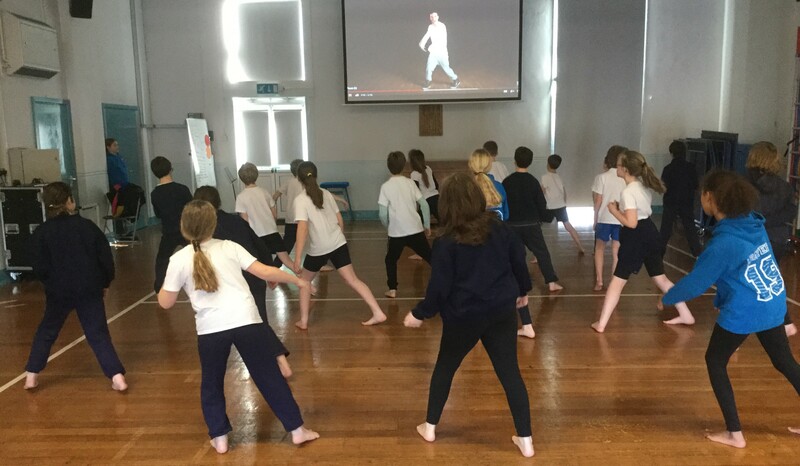 In Healthy Choices Week, we enjoyed a skipping session. A visiting coach taught us lots of new tricks for us to try. It was brilliant fun and really good exercise. We’re definitely going to keep practising our skipping at lunchtimes from now on. We always enjoy World Book Day at St. Mary’s. We of course joined in with the fun of dressing up as our favourite book characters. 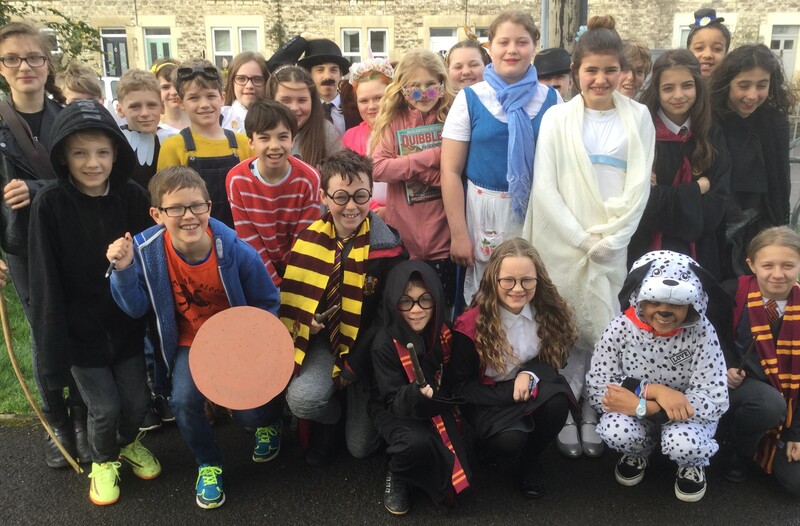 The Year Six Eagles had quite a range of different costumes, although Gryffindor was very well represented with a lot of Hogwarts students joining us for the day! In the photo, see if you can spot Elizabeth Bennet from Pride and Prejudice. Perhaps our favourites were Thomson and Thompson from The Adventures of Tintin who you might be able to see in the background. Well done everybody for such a brilliant effort. You all looked fantastic! 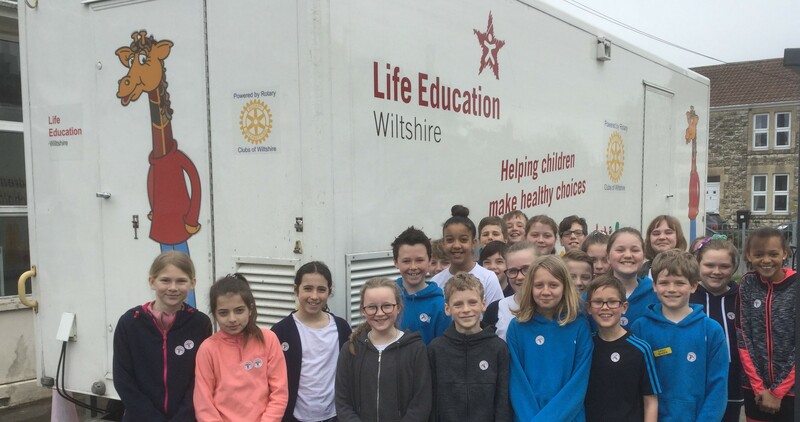 We had a brilliant day with members of the Bath Philharmonia, one of the leading professional orchestras in the South West. We worked alongside these talented musicians to produce our very own symphony! 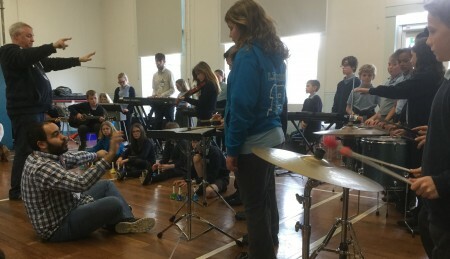 We worked individually in our different sections before coming together to assemble our classical piece, which had a pastoral theme but also contained a section that had a hint of menace! At the end of our time with the Bath Philharmonia, the Year Six Orchestra performed our symphony in front of a packed audience in the school hall. It sounded amazing! Congratulations to our Term Three Award Winners! 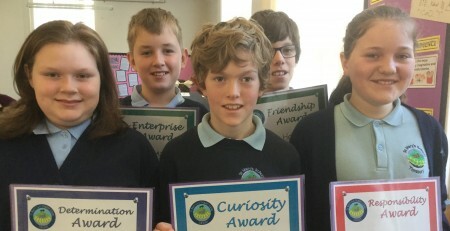 Everybody in The Eyrie has continued to impress but these were the children selected to be specially rewarded for their Curiosity, Responsibility, Enterprise, Determination and Friendship. 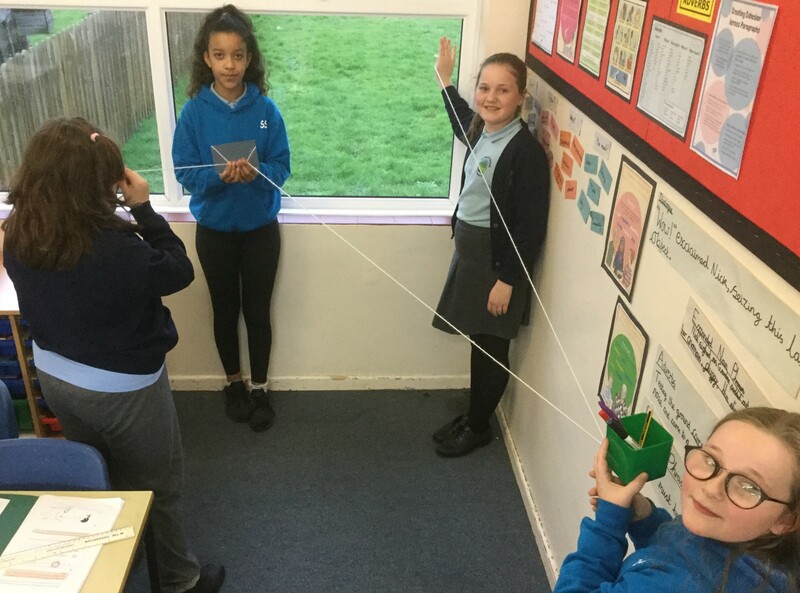 We carried out an investigation based on the idea that, because light travels in straight lines, shadows will always have the same shape as the objects that cast them. 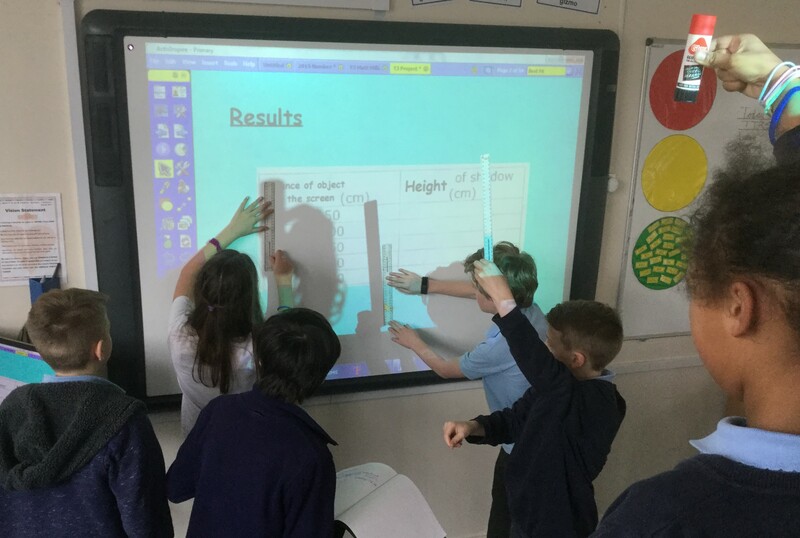 We held our objects at different distances from the screen and then measured the heights of our shadows. 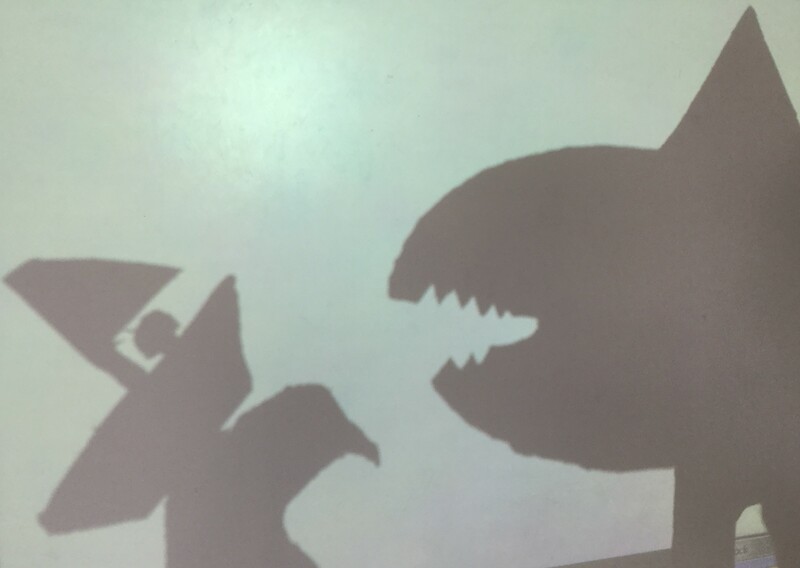 We found out that the shadows became bigger as we moved the object further away from the screen and closer to the light source (the projector). This is because more of the light is being blocked. Our Science Topic this term is Light. Did you know that light travels in straight lines? Light is produced by a light source. It then reflects off an object and goes into our eye via the pupil. This is how we see things. In the photo, you can see how we used wool to represent the light. Light enters through the window, is reflected off the pencil pot and then off the mirror into the eye. Today, we watched the BBC Live Lesson which featured Charlie Higson and Frank Cottrell Boyce who were introducing this year’s 500 Words writing competition. 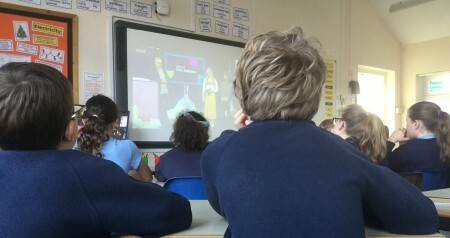 Schools around the country were also tuned in to gain writing tips and advice on how to create interesting and exciting stories. 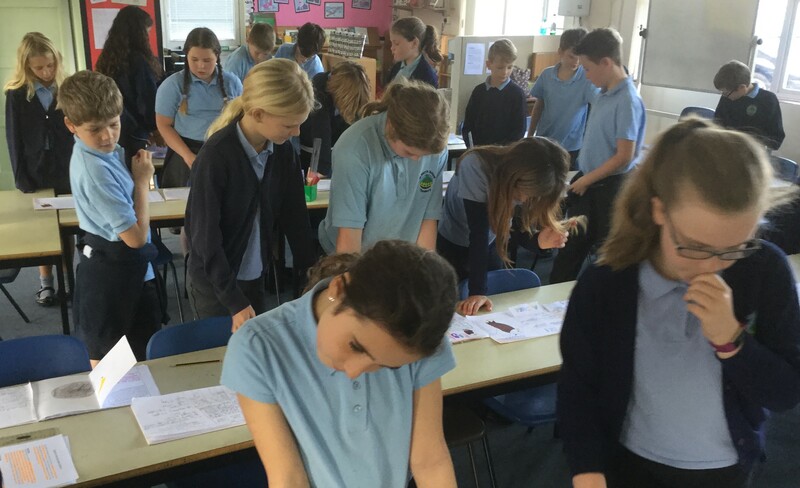 It generated a great deal of enthusiasm in The Eyrie and we couldn’t wait to start planning our own stories. We are looking forward to entering this competition. 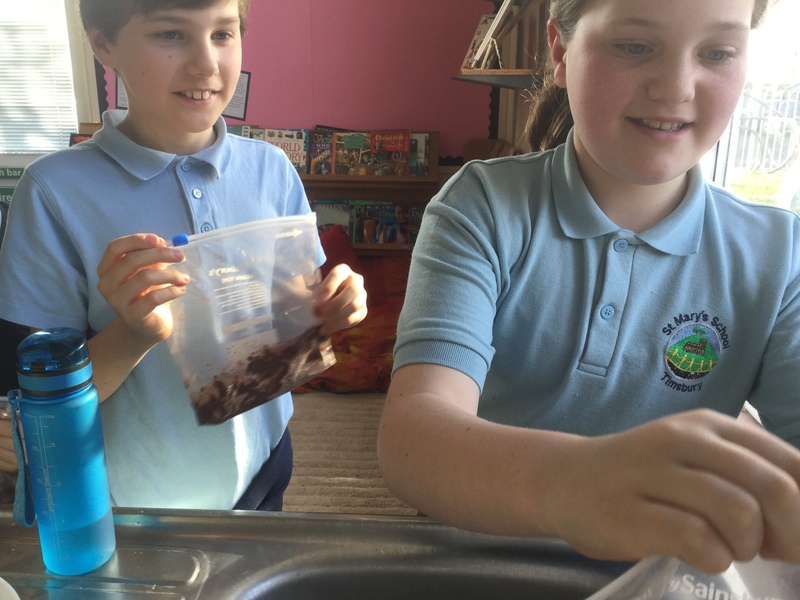 We put several spoonfuls of chocolate pudding mix and powdered milk into a sealable bag. 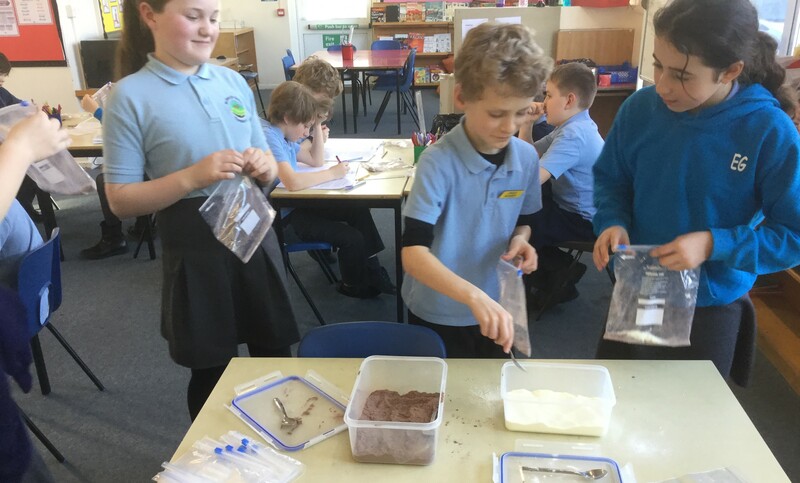 We shook the mixture to combine the two powders. Then, we added a little bit of water and squidged the bag until the powdery mixture came together to form a pudding-like consistency. Then, like true astronauts, we cut the corner off the bag and squeezed the space pudding into our mouths. Delicious! 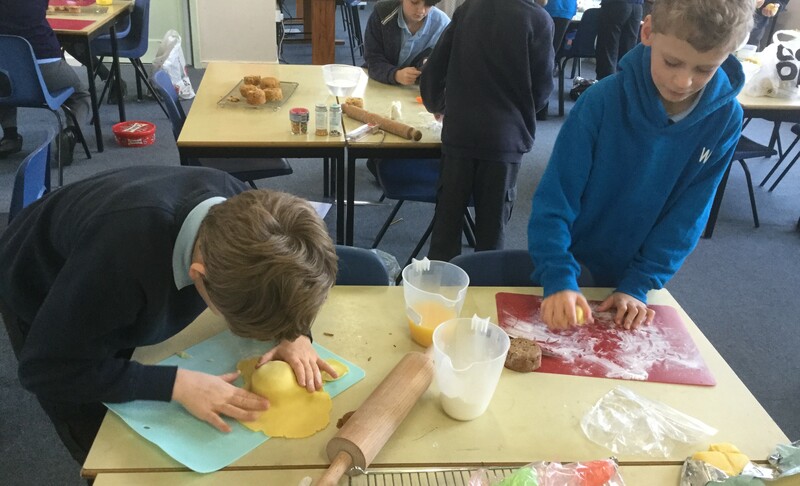 As we have been learning about Neil Armstrong this term, we decided to end our topic with a fun food activity. Food is taken into space in a dehydrated state because water would add too much weight to the rocket creating much higher fuel costs. As the astronauts can make their own water in space, they add it to rehydrate the food so that it can then be eaten. We decided to make our very own astronaut chocolate pudding. In the second half of each session, we are switching styles from contemporary dance to street dance. We are following Mihran Kirakosian’s series of Hip Hop Tutorials for Beginners. They are quite challenging routines but we are really enjoying following his moves as we watch the videos and copy what he does. 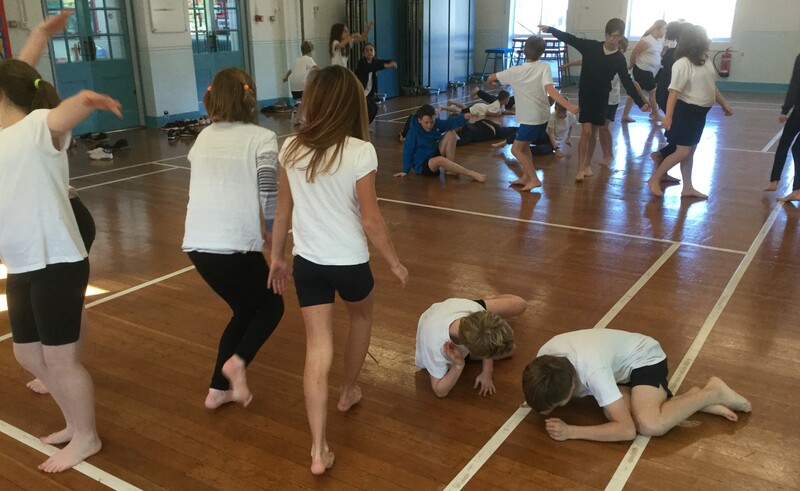 Our Dance sessions this term are in two parts. In the first half of each session, we are working on contemporary dance routines based on the topic of Space, using our imaginations to create rockets and then visiting the Moon, before exploring alien planets in other galaxies. In the photo, you can see each of our groups travelling through the multiverse in our spacecraft. In English, our fiction genre this term has been quest adventure stories. These are stories where the main character goes on a specific mission and encounters problems which have to be overcome along the way. There are choices for the reader to make at the end of each chapter and, depending on which option they have taken, the story heads off in different directions. We each wrote the first chapter of a quest adventure story set in space. We then performed our stories to the rest of the class and evaluated them based on how successfully criteria had been met that we had discussed and agreed on beforehand (for example, description of setting and ideas for the mission). We then voted for our favourite. You can read the winning chapter below which was a superb piece of writing by Jake. Now we have agreed on our opening chapter, each of us will write another chapter to form part of our whole class quest adventure story which we will make into a book. In this photo, you can see us practising how you should leave a burning building. Because smoke rises, keeping low means that you will be breathing in the cleaner air lower down. Following this, we phoned the emergency services in a mock 999 call. The adults who came with us were the people on the other end of the phone, asking exactly what you would hear if you had to do this for real. 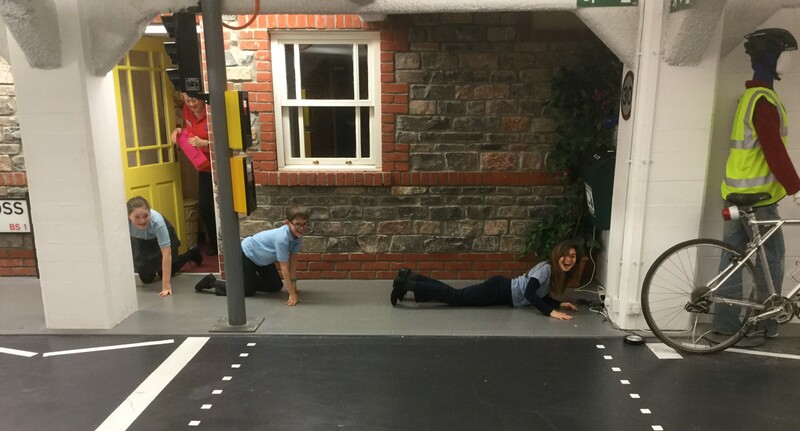 We went to Lifeskills at The Create Centre in Bristol where we took part in activities set in realistic scenarios, experiencing difficult or dangerous situations in this safe environment and learning how to deal with them. The settings included houses, a road, a shop, a dark alleyway, a river and a railway line. In the photo, you can see the shop where we were taught about the difference between ‘Use by’ and ‘Best before’ dates. They also short-changed us when we paid for our items and we learnt to always check that we have been given the correct change before leaving the shop. Well done to all of the Eagles for working so hard and making such good progress during these first two terms. We know how successful 2019 is going to be for you all. 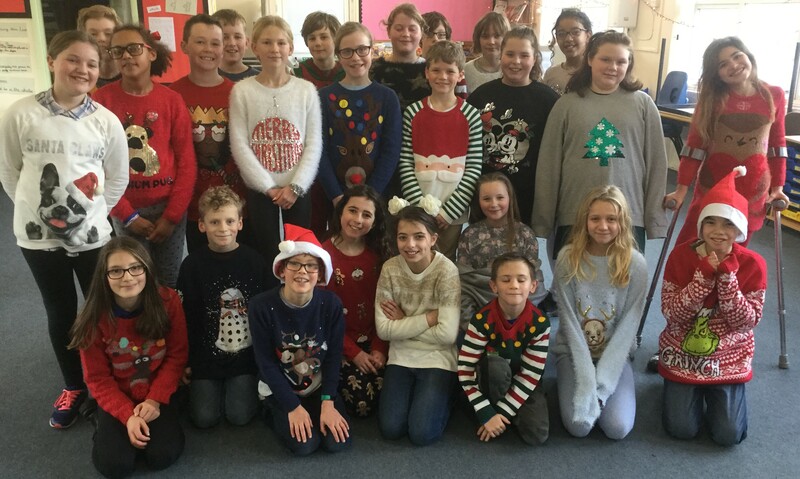 From all of us in The Eyrie, we would like to wish everyone a very Happy Christmas! Have a super holiday and we’ll see you in the New Year! We enjoyed trying out the games that each group had made. In the photo, can you see that the bulb on the left has lit up? This means that a complete circuit has been made by the wires touching. It wasn’t as easy as we thought it would be! It was great fun though. 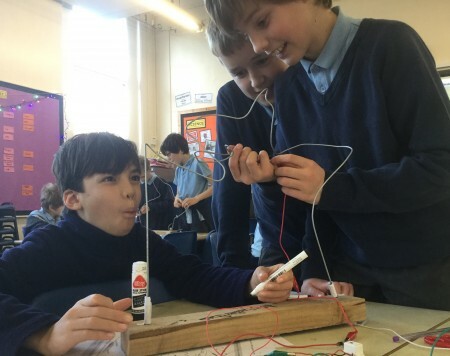 Our final week of our Electricity unit in Science has seen us design and make our own steady hand games. This is where you have to get a loop of wire from one end of a course to the other without touching the wire on the way, otherwise a buzzer sounds or a bulb flashes. We have had great fun working out how to create the correct electrical circuits required and testing out our games to make sure they worked effectively. We also discussed what electrical conductors and electrical insulators are and how we could use this knowledge to build in rest points at certain places along the route. At the Term Two Awards Assembly, the subject cups were handed out. These were our nominees for the Maths, Science, Art, Music and PE cups. As you can see, our class landed the Science Cup! We were very proud of all of our nominated Eagles who took to the stage. Congratulations to our Term Two Award Winners! Everybody in The Eyrie has continued to impress but these were the lucky children to be specially rewarded for their Curiosity, Responsibility, Enterprise, Determination and Friendship. 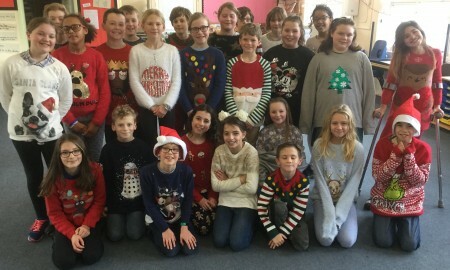 In English, we have been learning the story of It’s A Wonderful Life from the well-known Christmas movie. In the film, George Bailey is saved by his guardian angel, Clarence Odbody. George says to Clarence, “You look like the kind of angel I’d get!” This is because Clarence hasn’t earned his wings yet. This got us thinking about what our own guardian angels might look like. 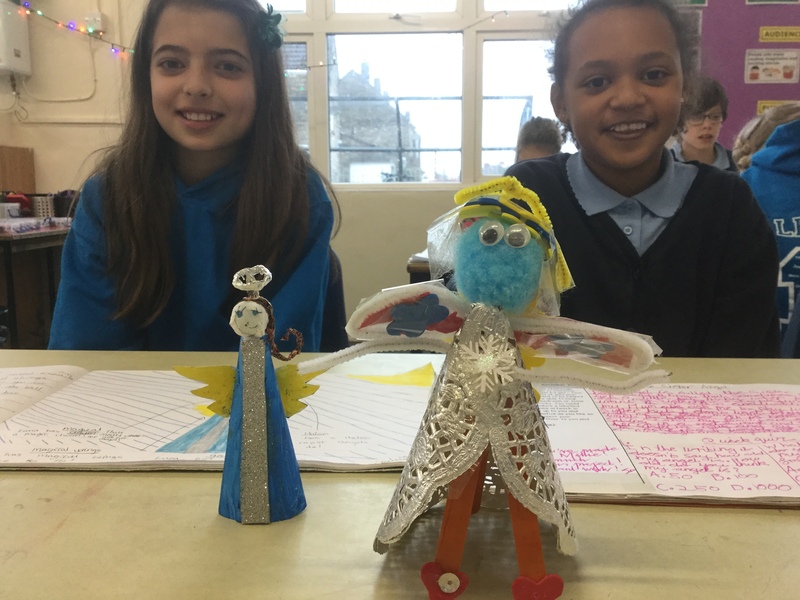 As a Learning Log challenge, we were given the task of creating our own guardian angels, describing their appearance and stating what their main roles would be. There were a lot of guardian angels being used to help with homework! As you can see, some children made models of their guardian angels. 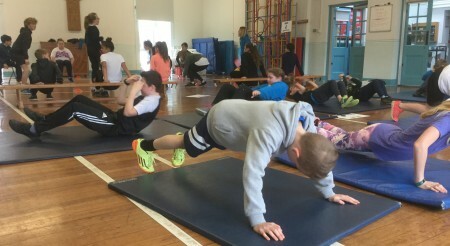 We have had a super term of gymnastics in PE. 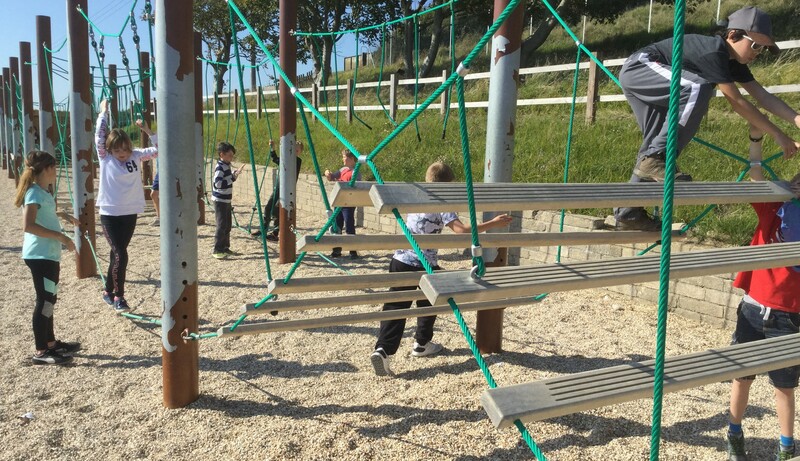 Our shape work has gone from strength to strength and we have performed impressive routines on the large apparatus, demonstrating excellent control and poise. Everybody has really enjoyed these sessions. Et voila! The Christmas cakes were finished and ready to be taken home to be shared with our families, who we hope were very impressed with our final products. This has been a wonderful DT project. 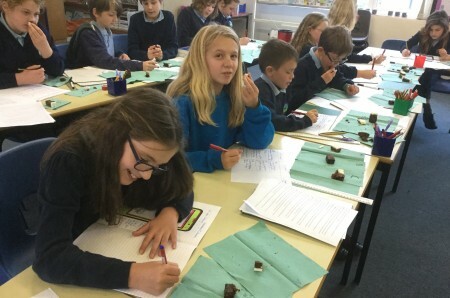 We have all learnt a lot about the history of Christmas cakes, the traditions involved in this festive food and the skills and cooking techniques required to enjoy success. We are reliably informed that they tasted delicious and were definitely a hit! Our next job was to repeat this process but with icing instead of marzipan. Also, this time, we brushed water onto the marzipan to help the icing to stick. Then, we decorated our cakes using a variety of different methods: making our own decorations out of icing, adding edible shop-bought decorations or, as you can see in the photograph, using different coloured icing. We really enjoyed this stage of the process! 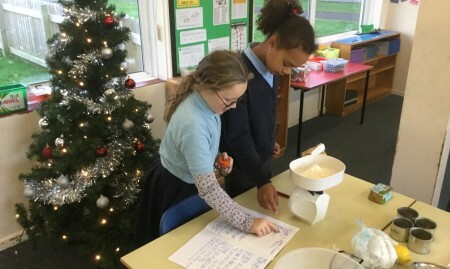 The following day, we were ready to decorate our Christmas cakes. Firstly, we poured a little orange juice onto our cakes to help to keep them moist. We then added a thin layer of jam which would be the ‘glue’ to stick a layer of marzipan onto the cake. We rolled out the marzipan using a rolling pin and then lay it on top of the cake to completely cover it. Soon, the mixtures were ready to be carefully spooned into the half-sized baked bean tins. 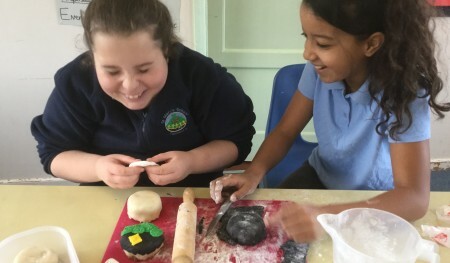 They had been lined with greaseproof paper so that the cakes would not stick to the tins and the false bottoms meant that the cakes would be very easy to remove after they had been baked. Then it was time for them to go into the oven. If you’re interested, the cooking directions are 150 degrees Celsius for about an hour and a half. 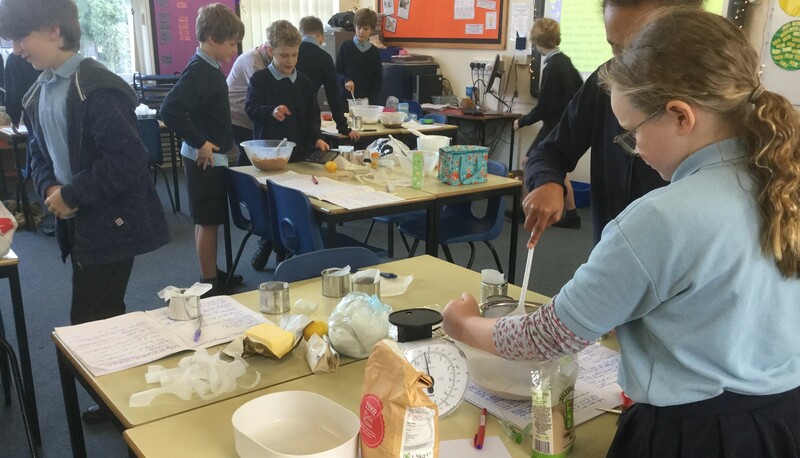 The cake mixtures started to be formed very professionally. In went the flour, sugar, eggs and butter. Each group were using different types of dried fruit, depending on what they liked and what their own specially created recipes specified. In the photo, you can see some zesting going on. There was a rather pleasant citrusy aroma in the classroom at this point! As you can see, the cookery session is well underway now. 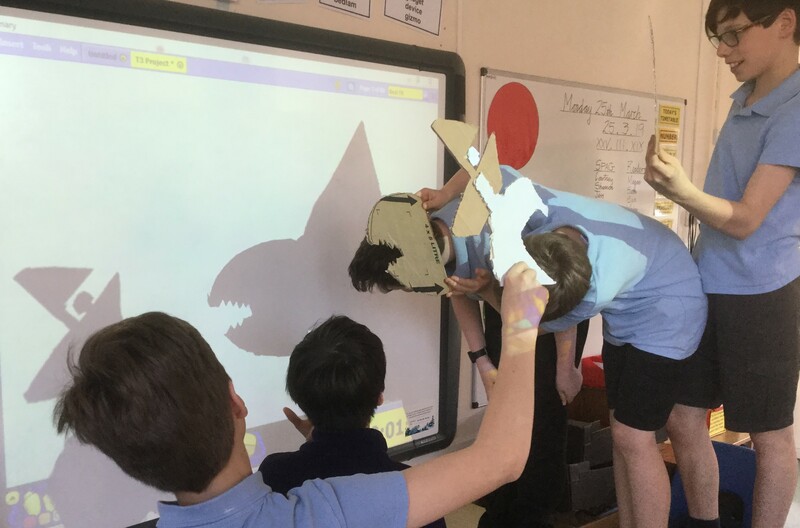 Each group worked brilliantly together, sharing out the tasks and cooperating really well as they aimed to create a successful final product. As we worked, we jotted down things that didn’t go as well as we had planned and how we managed to overcome any problems we met. There was a lot of Maths involved because we needed to accurately weigh out the correct mass of each ingredient. Can you see the half-sized baked bean tins in the photo? These would become our baking tins. The bottom of the tins were loose so that we could carefully push the cakes up and out after they had been cooked. We lined the tins with greaseproof paper. Before we began, we read through our recipes to check that we knew exactly what we had to do and were confident about the order of the steps that needed to be taken. We arranged all of our ingredients on our tables just like you see the TV chefs do! We have had a wonderful time in The Eyrie this week making our Christmas cakes. Thank you to all of the parents who enabled this to happen by donating the ingredients. We couldn’t have done it without you! Everyone has really enjoyed this whole experience. It has been fun, creative and rewarding. This is us getting ourselves set up at the start of the process. Remember that some of us had to go and get our dried fruit, which had been soaking in orange juice in the fridge overnight. Twenty-four hours before making our Christmas cakes, we prepared our dried fruit by soaking it in orange juice. Traditional recipes might use brandy for this but obviously we are using a child-friendly version. 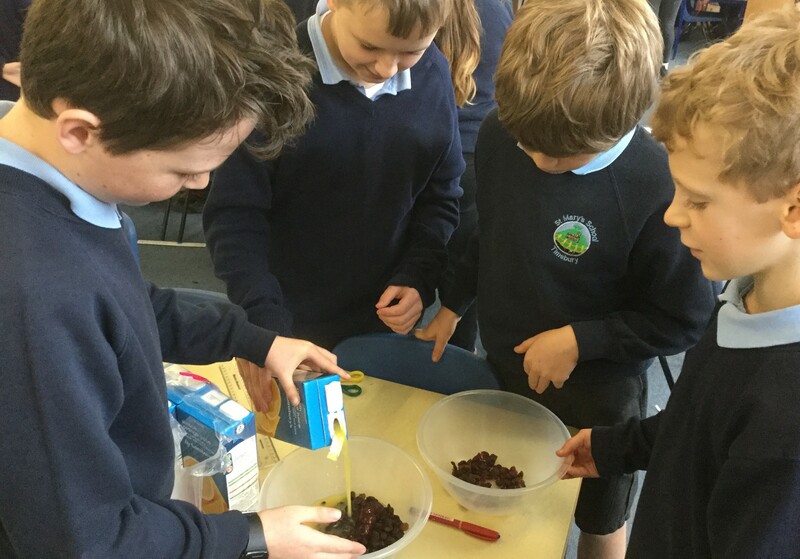 We are using a range of different types of dried fruit: raisins, sultanas, cherries, apricots and mango. 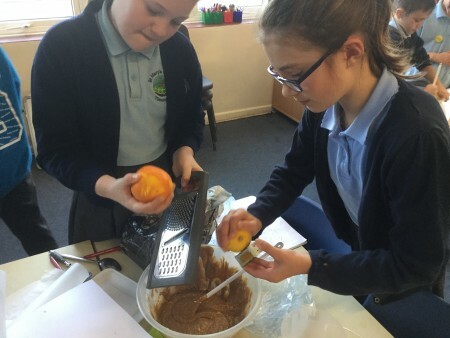 Some of us also grated some orange zest into the mixture. The fruit will soak in orange juice in the fridge overnight ahead of us baking tomorrow. 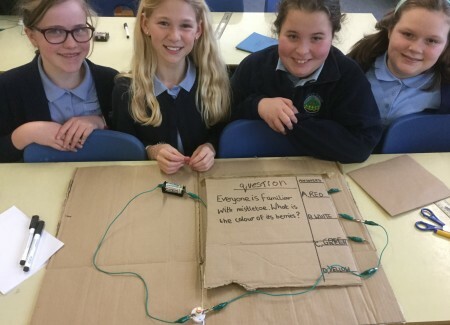 We made electrical quiz boards. We thought of a good Christmas question and wrote four answers for it, only one of which was correct. When the wire touched the metal clip next to the correct answer, the bulb lit up. Only the wire leading from the correct answer would complete the circuit. The other four wires were hidden behind the flap of cardboard. This team’s question was: ‘Everyone is familiar with mistletoe. What is the colour of its berries?’ The four answers were red, white, green and yellow. Which answer do you think lit the bulb? 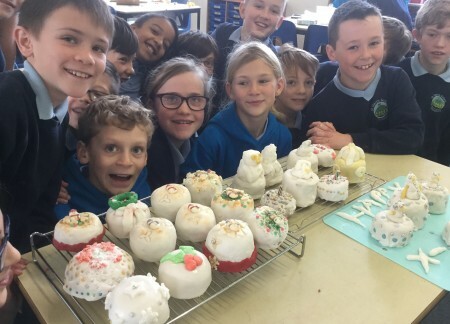 Our Design Technology project this term is focussed around Christmas cakes. We will be baking our own Baked Bean Tin Christmas Cakes later on. However, we began by investigating products to collect ideas. 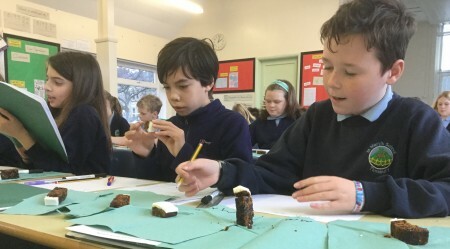 We tasted three different brands of Christmas cakes: Mr Kipling Christmas Slices, Morrisons Iced Christmas Cake Bar and Sainsbury’s Iced Rich Fruit Cake. We used technical vocabulary to describe the sight, smell, touch and taste of these three different cakes. We are in the local papers all over Somerset! 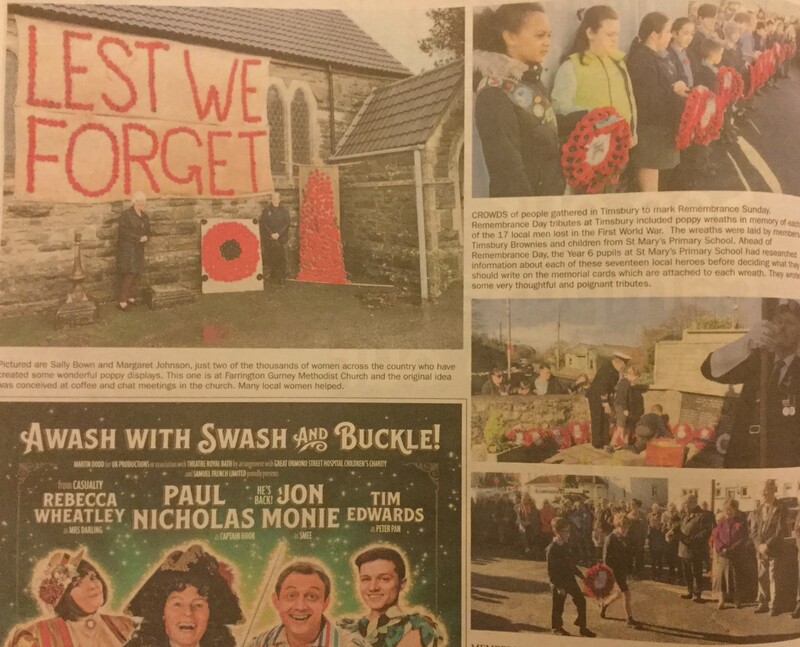 It’s great that so many people will get to hear about our Remembrance Sunday experience because we were so proud to take part and fulfil such an important role. 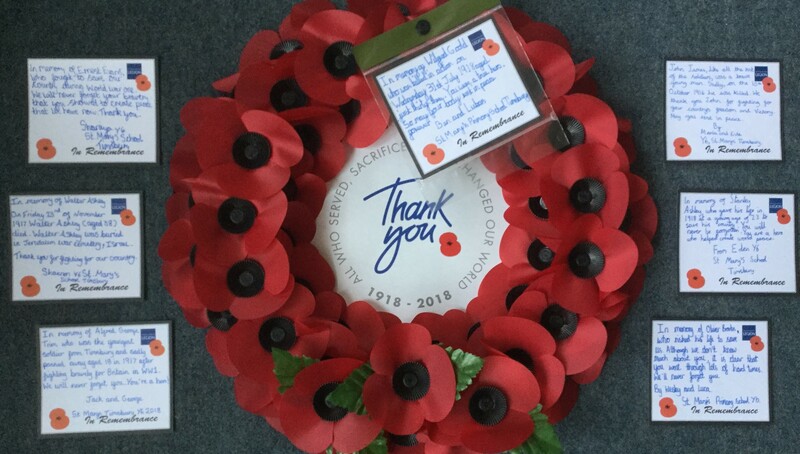 Thank you to the local residents (especially the ones with no links to the school) who have contacted us to let us know how much they have appreciated the special words we wrote in dedication to each of the soldiers. We appreciate you taking the time to tell us how touched you have been by our memorials. In Term Two, our focus in art lessons is Tone. We looked at various portraits drawn by the artist Kathe Kollwitz. She was a German artist who was known for her portrait work and the clever use of tone she used to create them. We studied a range of her portraits before attempting to copy them, using the skills we thought she might have used. We discussed using our pencils in different ways to create different tones and also using hatching or cross-hatching as alternative techniques to create tones. 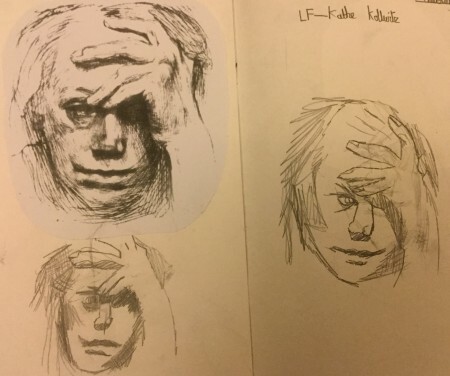 In the picture, you can see Kollwitz’s portrait in the top left. The other two sketches were brilliant attempts by Luca in copying her work. He really did a superb job! The theme for Anti-Bullying Week 2018 was Choose Respect and it ran from the 12th to 16th November. 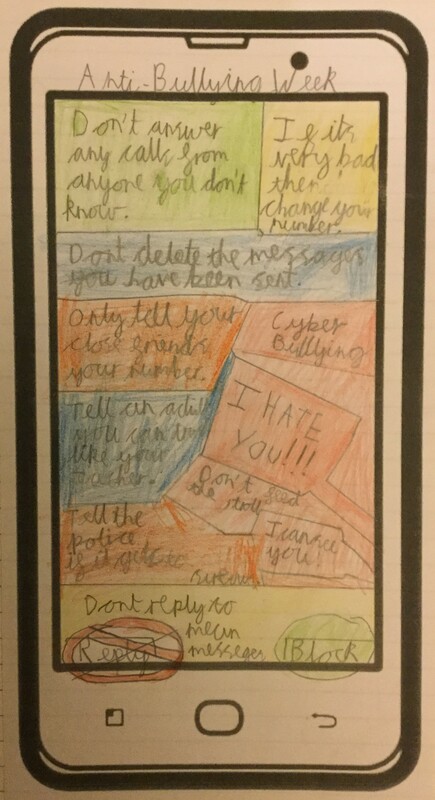 In Year Six, we decided to focus on Cyberbullying and how we should behave respectfully towards other people when we are messaging them through our computers or mobile phones. We thought about what actions we should take if we felt we were the victim of cyberbullying. If you ever come across cyberbullying, here is our advice on how to tackle it: 1) Save any evidence of the bullying and show an adult. 2) Block the message or the person and do not respond to them in any way. 3) Log off the site where the cyberbullying is happening. 4) Talk to someone you trust about it. We made posters to show this advice. You can see Oscar’s here. Thank you to everybody who visited our World War One Exhibition recently. We hope you enjoyed looking at our artwork. The Year Six Eagles were given the task of creating World War One pictures through using pencil. We were allowed to put one bit of colour onto our sketches. This wonderful picture was created (appropriately enough) by Poppy. Our thanks to Mr Fiddes and everybody at The Royal British Legion in Timsbury for asking us to be part of this very special event. The Year Six Eagles are proud to have been given the role of laying wreaths for the seventeen Timsbury heroes on this 100th anniversary of the end of World War One. We will remember them. Each of us in turn walked over to the War Memorial carrying our wreaths. 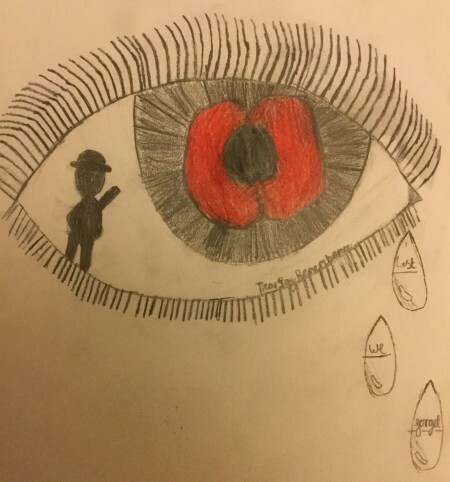 We had spent a lot of time researching information about the soldiers who died and considering what we might want to write on the special tribute cards which are attached to each poppy wreath. 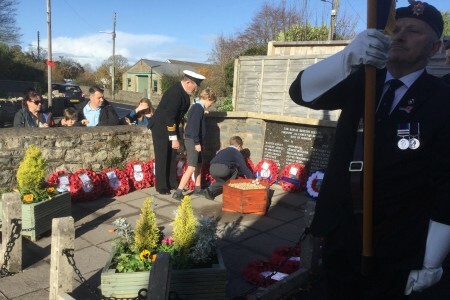 Please visit the War Memorial in Timsbury to see our seventeen wreaths (alongside the others which were laid on Remembrance Sunday) and to read our tributes. 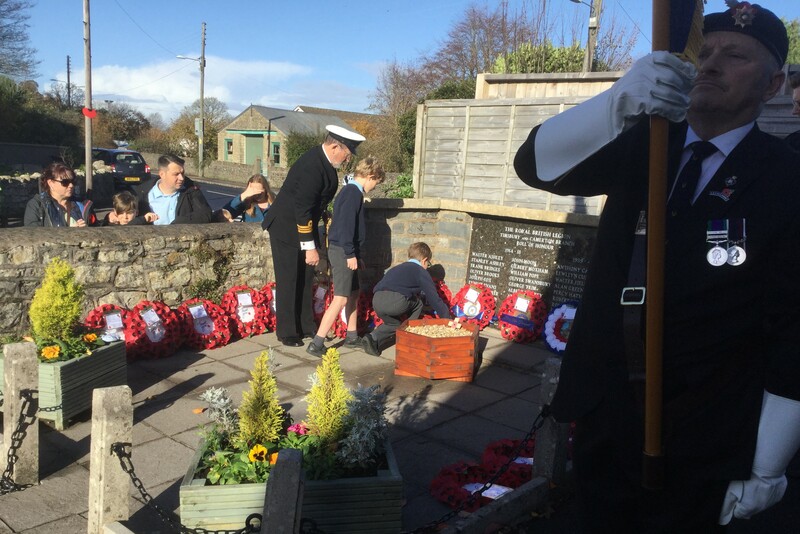 Well done to all of the Year Six Eagles who turned out today to play their part in Timsbury’s Remembrance Day Service at the War Memorial in the village. Our role was to lay wreaths for each of the seventeen men from Timsbury who lost their lives during World War One. 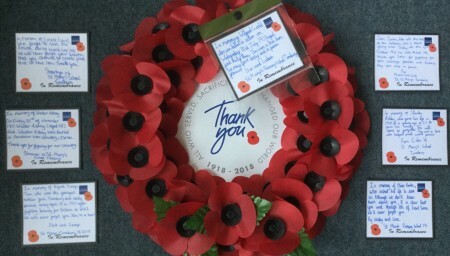 We have been very proud of the thoughtful and respectful manner in which the children from our school have approached this special task which we were asked to perform by The Royal British Legion. 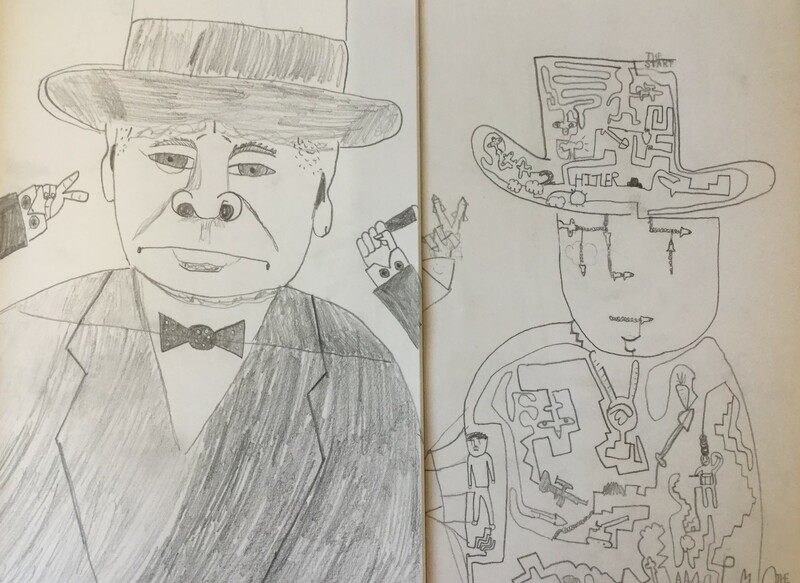 In Art, we looked at images of Winston Churchill before creating our own pencil portraits of him. After that, we studied the work of Pierre Emmanuel Godet who uses single continuous lines to create faces of famous people. His work includes John Lennon, Michael Jackson and even Darth Vader! 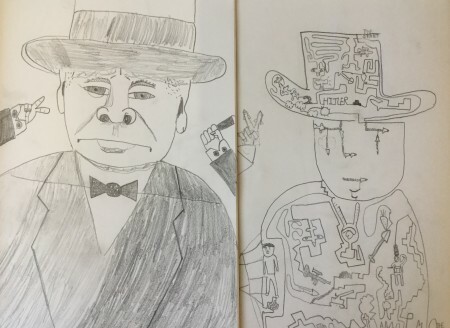 We had a go at our own one line drawings of Winston Churchill. Godet includes little images of subjects from the events of that person’s life in his portraits so we attempted to do that too. Thank you to everybody who visited our World War One Exhibition in The Eyrie. We hope you enjoyed looking at our pencil sketch artwork and seeing the very thoughtful and poignant tributes we have written for the poppy wreaths. We hope that you can join us on Remembrance Sunday when we will be paying our respects to the seventeen Timsbury soldiers at the service at the War Memorial. Our finished World War Two dance routine looked fantastic. After working on creating movements linked to key themes (e.g. 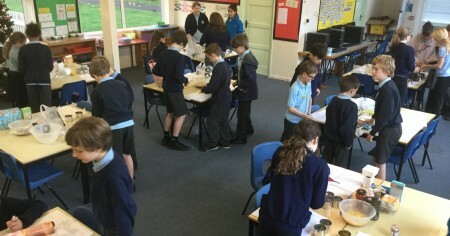 the Blitz, evacuees, Dig for Victory, in the shelter, on the battlefield etc. ), we paired up and synchronised our actions to create a visually more interesting performance. The range of different levels and speeds, the partner work and the use of space showed how well we had developed as dancers since the beginning of this unit of work. 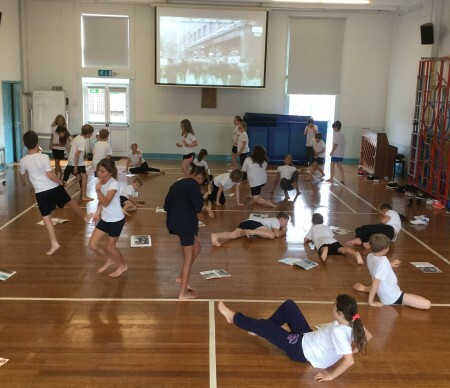 We were also able to demonstrate good musicality, matching our movements to the rhythm of the music track accompanying us, which was London Can Take It by Public Service Broadcasting. We enjoyed going round looking at each other’s Learning Logs. This Home Challenge was on the topic of Eagles. Some super research had taken place to find out interesting facts about different species. 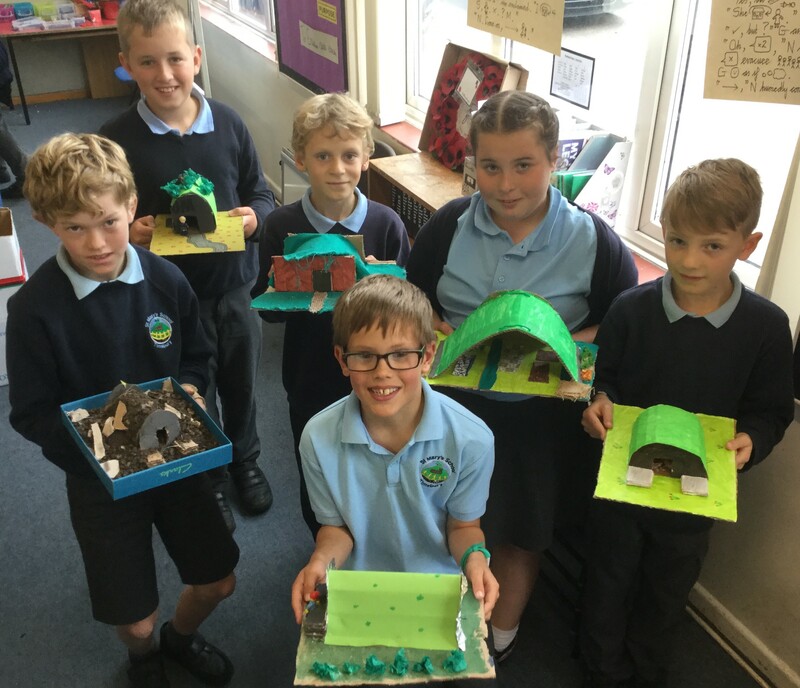 Some children had made amazing models while others had presented their work through beautiful artwork, quizzes or even board games. Well done to everybody for your super projects! Congratulations to our Term One Award Winners! Everybody in The Eyrie has made a superb start to Year Six but these were the six lucky children to be specially rewarded for their Citizenship, Curiosity, Responsibility, Enterprise, Determination and Friendship. Our cookery task was a huge success. 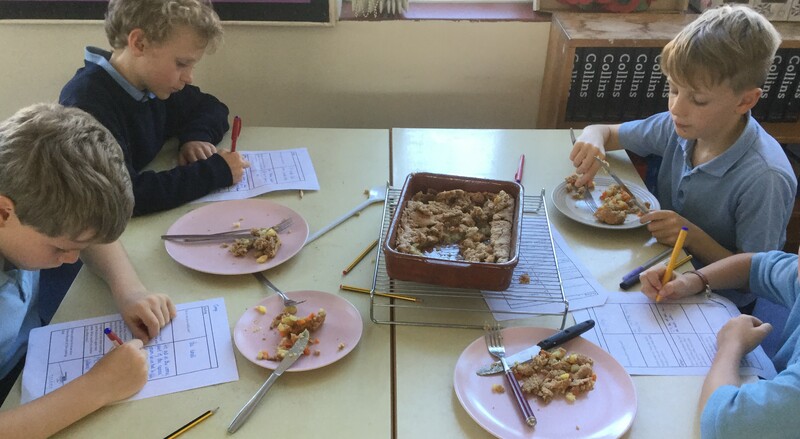 Everybody enjoyed tasting their pies and we evaluated our results, deciding what went well and making decisions about what we would do differently if we were going to make another Lord Woolton Pie in the future. 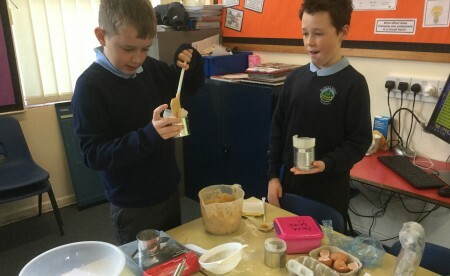 Although the recipe was reasonably straightforward, each group had to make their own pastry which presented a challenge but our class has very talented cooks who coped with this brilliantly. Lord Woolton promoted recipes that worked well with the rationing system. The most famous of these recipes was the Woolton Pie, which consisted of carrots, potatoes, parsnips and cauliflower with a pastry crust. This is what we made and the Eagle Chefs did an amazing job, with all the pies turning out spectacularly well. They looked amazing. Thank you to all parents for contributing the ingredients. We had a really fun day thanks to your help. Welcome to the Eagle Kitchen! 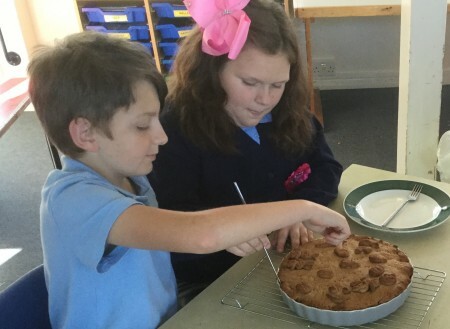 We ended our Battle of Britain project with a Fantastic Finale which involved cooking a World War Two recipe. During the war, food was really scarce and the British population were encouraged to grow their own vegetables. This was promoted through a campaign called Dig For Victory. In April 1940, Lord Woolton was appointed Minister of Food by Neville Chamberlain. Lord Woolton’s task was to oversee rationing during wartime shortages. 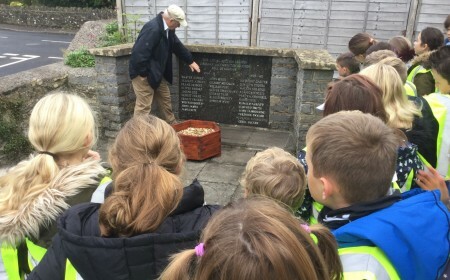 We walked to the War Memorial in Timsbury with Mr Fiddes from the Royal British Legion to see the names of the seventeen soldiers who lost their lives in World War One. 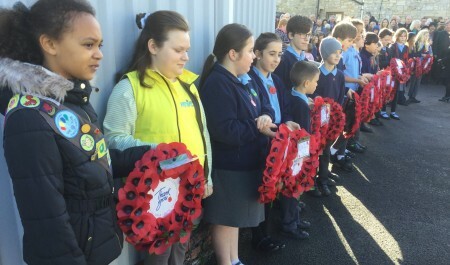 We will be back here on Sunday 11th November to play a very important part in Timsbury’s Remembrance Day Service, with seventeen of our Year Six Eagles laying a poppy wreath for each of these local heroes. We also walked to the cemetery and paid our respects at the grave of Private Moxham, the only one of the seventeen to be buried in the village. 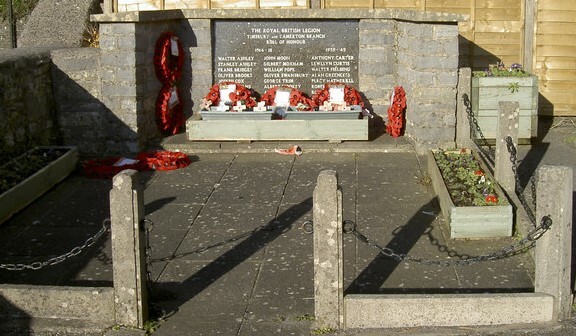 We will meet at the War Memorial at 10.30am on Remembrance Day and our part in the service will be completed by 11.30am. 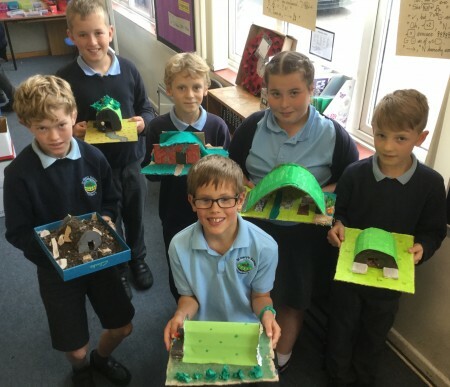 We have had a lot of fun making our Anderson Shelter models. We designed our models carefully, working out exactly how we wanted them to look. We gathered the resources and materials required to construct our structures. Then, we used tools, including saws, to create a framework to a carefully calculated design specification. Cardboard was then put over the framework and it was decorated to make it look like it would have done during World War Two. Did you know that people put soil over the top of them to grow their own vegetables in because food was so scarce? 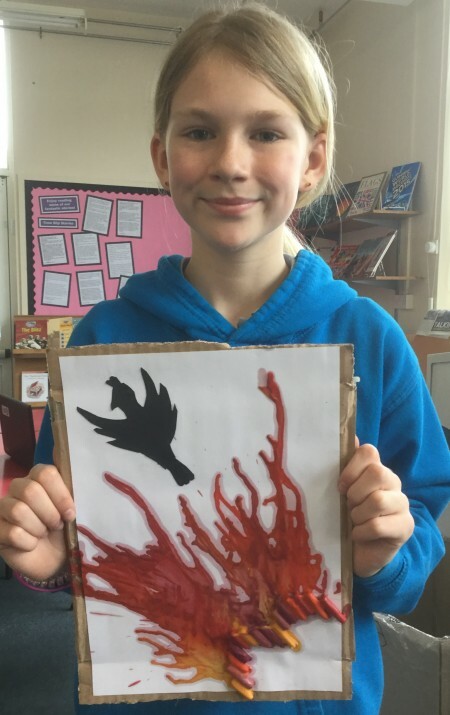 The Year Six Eagles are very honoured to have been asked to play a very important part in this year’s Remembrance Day commemorations on November 11th. 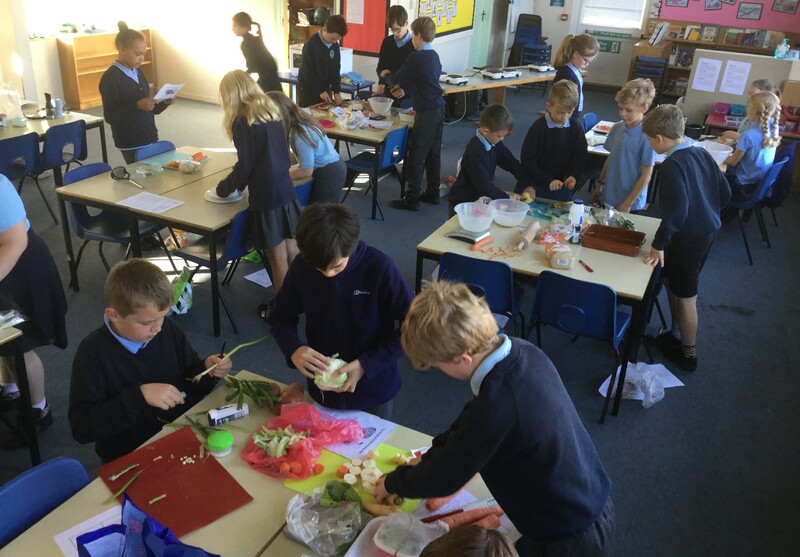 Seventeen children from our class will be paying tribute to the seventeen soldiers from Timsbury who lost their lives during World War One. We will be researching information about these local heroes before writing our own fitting tributes which we will then perform on the day, before laying seventeen poppy wreaths in their memory. As part of our The Battle of Britain topic, we have been learning all about the Blitz and how people tried to keep themselves safe during this time. We have discovered how children were evacuated to the countryside away from the cities which were being bombed and we have researched how those who remained in the cities attempted to protect themselves, including carrying out blackout procedures and building Anderson shelters. 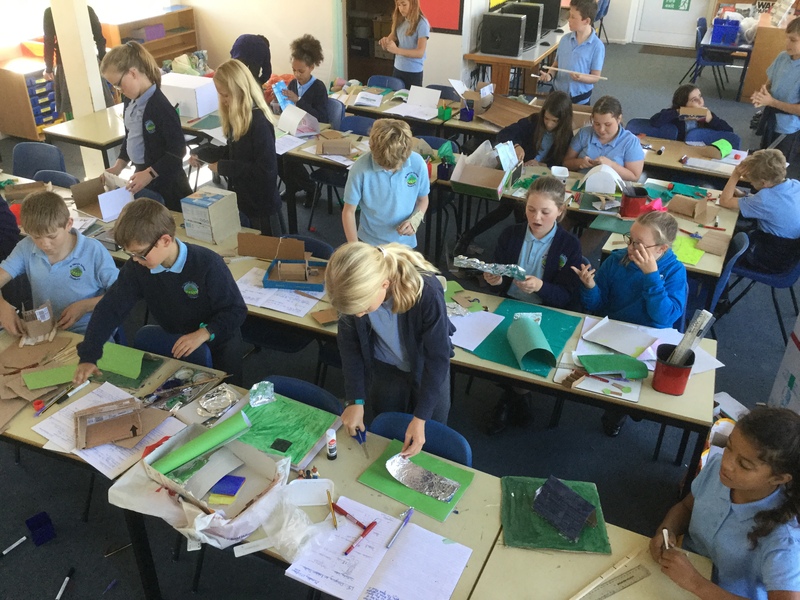 In DT, we planned our designs for models of Anderson shelters and we have now started to build them. We researched their shape and size, how they were camouflaged in people’s gardens and what furniture would have been inside. We will show you our finished models when we have completed them. 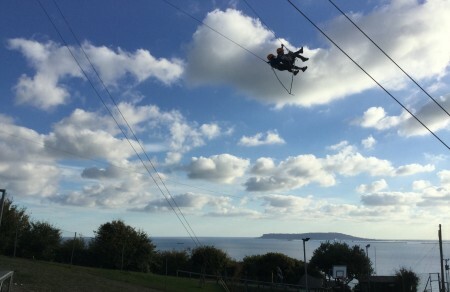 We had an amazing time at PGL in Osmington Bay in Dorset. We enjoyed lots of different experiences and all of our instructors were very impressed with us. It was a happy week of fun and challenging opportunities which will have helped to build our self-esteem and confidence. It was great to be a part of Team Eagles! This is the Raft Building activity at PGL. This was our final activity of the week and one of our favourites. 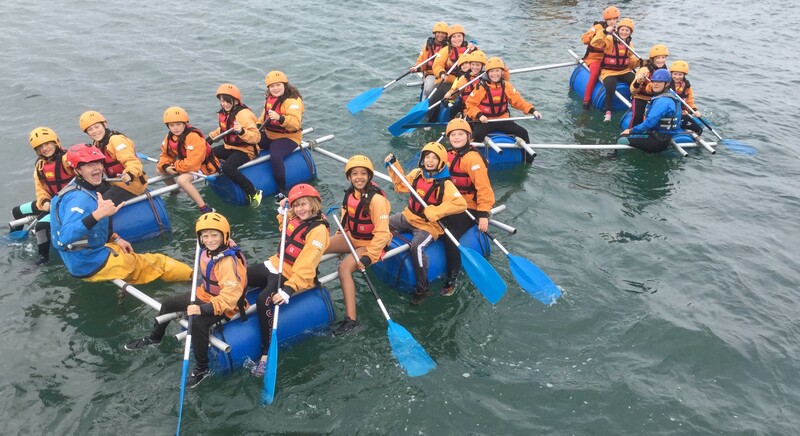 Each team built their own raft, tying the poles together and securing the barrels, before launching their vessels into Portland Harbour and paddling around. It was brilliant fun! 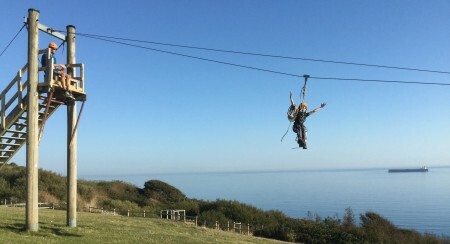 This is the Zip Wire activity at PGL. The zip wire was in an amazing location at the Osmington Bay site, on a hill overlooking the English Channel with wonderful views across to Weymouth and Portland Harbour. We all enjoyed our trip whizzing down to the bottom of the hill but not so much the walk to the top again, pulling the rope and harness back up with us! 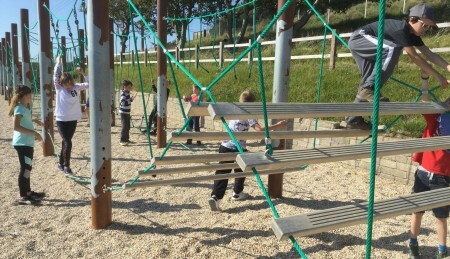 This is the Low Level Ropes Course activity at PGL. Each person on the course had two teammates to support them with either their ‘Ninja Squirrel’ position to push them back on or their ‘Fist of Friendship’ to help them to balance. The course was tricky enough but then we had to get to the other end whilst holding a cup of water! Some groups managed this better than others! This is the Aeroball activity at PGL. This game involves scoring points by throwing balls into your opponent’s hoop whilst bouncing on a trampoline. Each team consists of two players, with each individual aeroballer having their own sealed bouncing compartment. It was a fun but exhausting session! 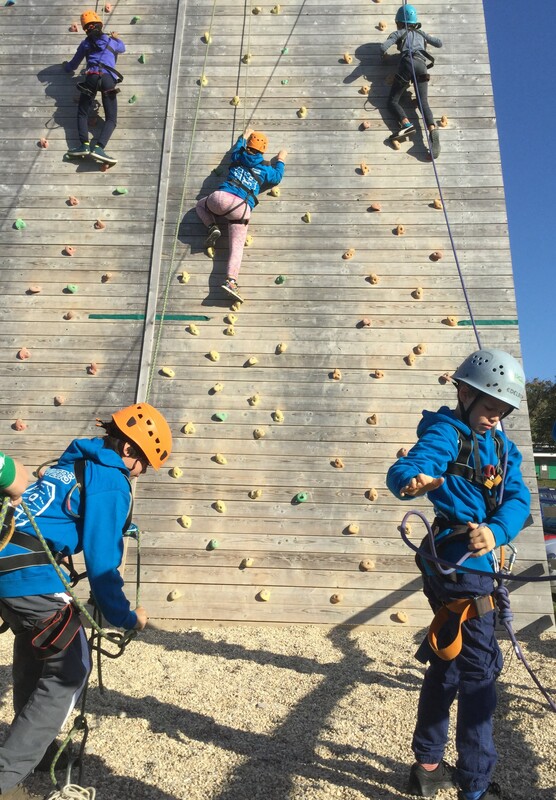 This is the Climbing activity at PGL. The climbing wall goes a lot higher than you can see in the photo. The children at the bottom are belaying. This is a very important job we were taught. Belaying is very technical but we became very skilled at it. A belayer distributes the rope that the climber needs to climb higher but also exerts tension to keep the rope taught. Therefore, a falling climber would not fall very far at all. This is the Tunnel Trail activity at PGL. 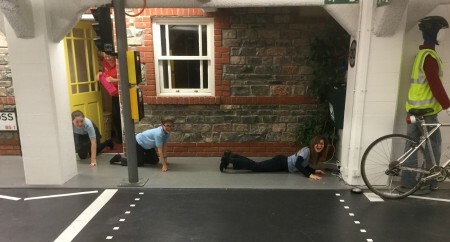 We enjoyed playing lots of different games which involved scrambling through the underground tunnels. The tunnels had different diameters, meaning that you needed to adopt different crawling techniques to travel through them. It was a lot of fun! This is the Kayaking activity at PGL. We left the Osmington Bay site and headed to Portland Harbour where the Weymouth and Portland National Sailing Academy is located. 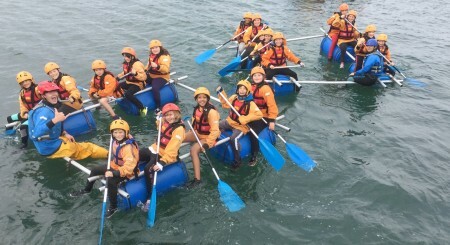 We changed into our wetsuits and then, after practising how to use the paddles correctly on land, we spent an hour kayaking around the harbour. We had a brilliant time! This is the Giant Swing activity at PGL. Two people sat in the swing while the rest of us pulled the rope like a tug of war team to take the pair backwards and upwards as high as they wanted to go. Then, one of the pair pulled the release cord and they were launched forwards at speed, sending them high above the Osmington Bay centre. The views from up there were amazing. In the photo, you can see Portland in the background. This is the Fencing activity at PGL. We learnt all about the safety equipment you have to wear when fencing and then spent time practising how to stand and then move in the correct positions. The swords we are using are called foils. Can you recognise who the Year Six Eagles are that are fencing in this photo? 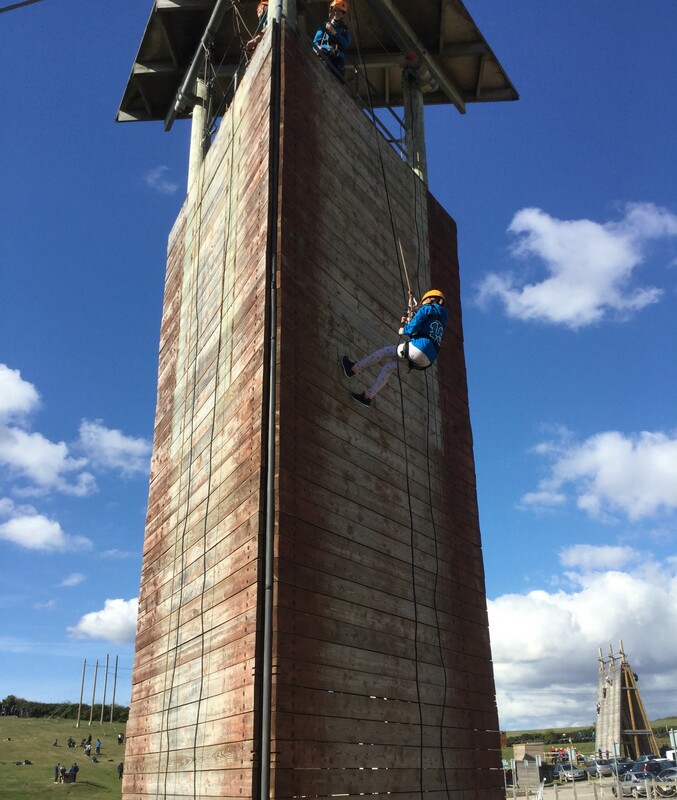 This is the Abseil activity at PGL. We had to climb the ladders inside the tower to reach the top. Our harnesses were attached to the ropes and then we leaned back and walked down the outside of the tower to the ground. The tower was very high. Some of us pushed off with our feet as we descended and tried the jumping technique rather than walking. You feed the rope through the carabiner attached to your harness to control the speed of your descent. It was great fun! 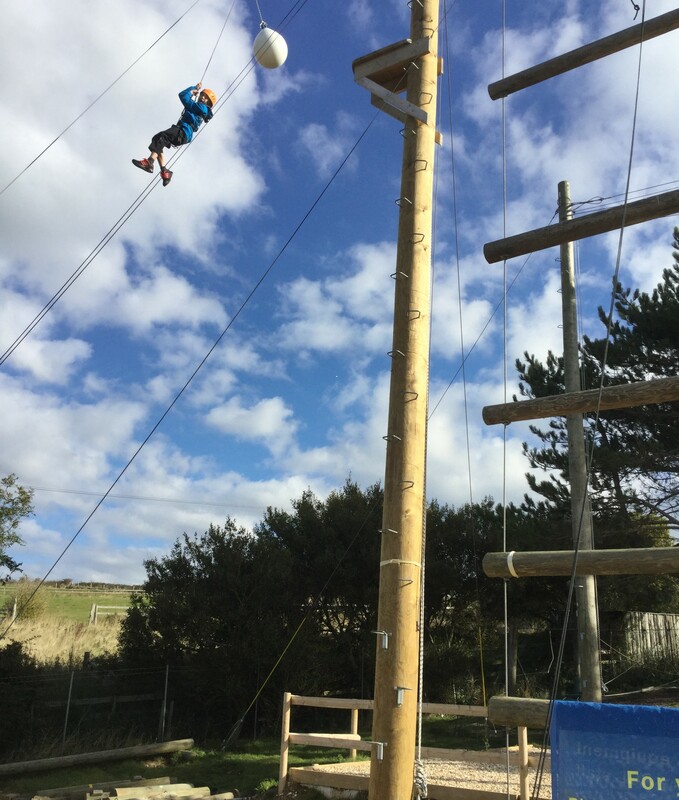 This is the Trapeze activity at PGL. It involves climbing up the telegraph pole to the little wooden platform which you can see at the top. Then, if you make it that far, you have to launch yourself off the platform and try to touch the white ball. You then swing around for a bit before you are brought down. Everybody managed to gain a huge sense of achievement on this activity. Even if we didn’t make it to the top, when we thought we had reached the point where we didn’t want to go any higher, everybody encouraged us with shouts of “Two more!” We then found the courage to climb two more steps before being lowered to the ground. We were all so proud of everybody. When we arrived at Osmington Bay, we walked down to the beach to have our lunch. We enjoyed searching for unusual pebbles on this beach and also looking at the amazing views across the English Channel towards Portland Harbour in the distance. We would be kayaking over there later in the week. 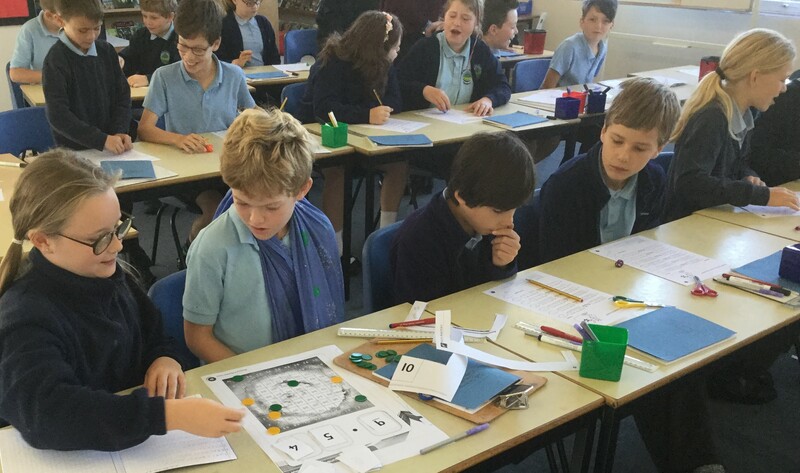 In Year Six, we have to be able to round any whole number to a required degree of accuracy. We rounded off our work on rounding by taking each other on in a series of challenges which required good rounding skills but also good tactical skills too! We had a lot of fun during this session. Some of us extended our learning by rounding decimal numbers to the nearest tenth. As part of our current topic of The Battle of Britain, we are creating a World War Two dance performance. We scattered lots of books containing interesting photographs of different aspects of the conflict around the hall floor as inspiration for ideas. Our task was to create a range of dynamic movements based on how the people in the photographs might have been feeling. On the screen, you can see that we were playing the video for If War Should Come by Public Service Broadcasting at the same time, as the music for our performance and as a backdrop for our dance. 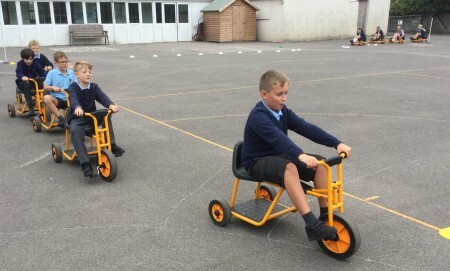 Our week of cycling activities, celebrating the Tour of Britain passing through our village, ended with our Tour de Timsbury event. Everybody brought their bikes to school (or scooters instead) and had great fun cycling around a specially designed course marked out on the school field. The whole school took part which made it quite an impressive peloton! The Tour of Britain featured a team time trial for the first time this year. It took place on stage five in Cumbria, covering 14 kilometres from Cockermouth to Whinlatter Pass in the Lake District. We found out about the different equipment and different tactics used during this test against the clock. Afterwards, we went outside to carry out our own team time trial. Can you see how we stayed in lines, closely behind each other, to keep in the slipstream and become more aerodynamic? 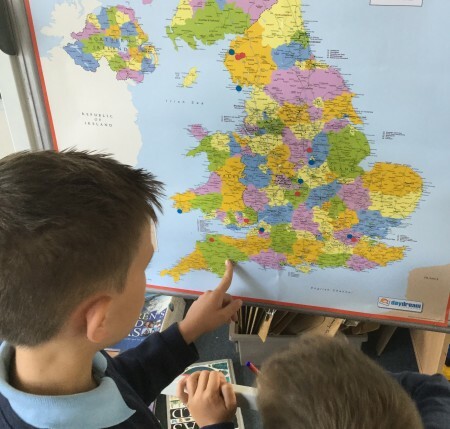 We have been developing our knowledge of the United Kingdom this week through looking at where the stages of the Tour of Britain have been taking place. We researched where the start and finish was for each of the eight stages and placed coloured stickers on the map to locate these places. Although we had a good knowledge of where Bristol and London were, other places required some efficient atlas skills to plot them accurately, such as Pembrey Country Park and Whinlatter Pass. In the photo, you can see us working out where Cranbrook is. 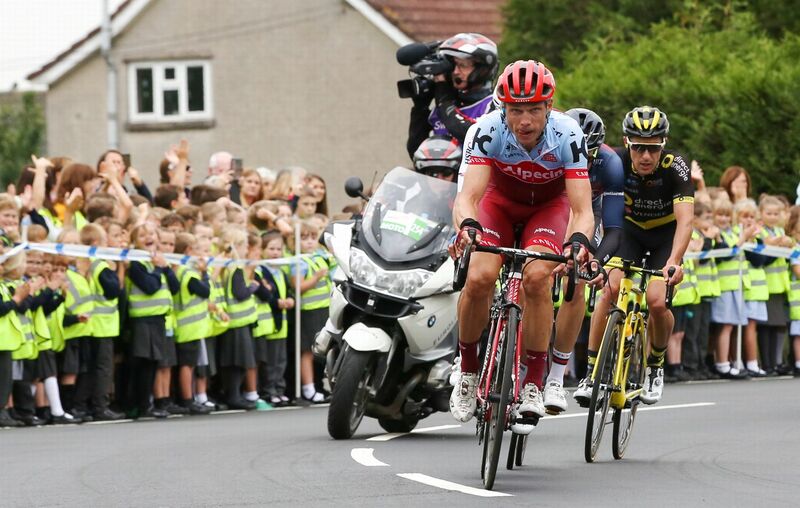 The first day of the brand new school year saw the Tour of Britain cycle along North Road in Timsbury. Our whole school turned out to cheer loudly as the professional cyclists, including Chris Froome and Geraint Thomas, passed by. It was an exciting and unique experience and one we will never forget. As we waited, police on motorbikes and people in team cars waved to us. Eventually, the race appeared, led by a breakaway group of four riders, with the peloton 54 seconds behind. They still had 47.2 kilometres to go before they would reach the finish line in Bristol.